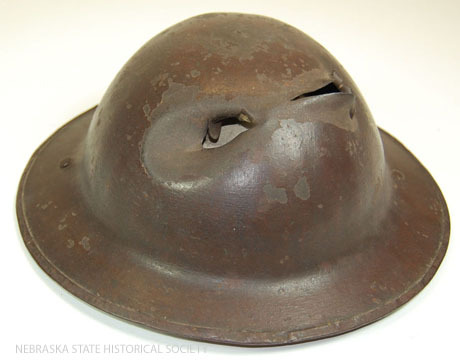 This helmet belonged to Dr. Charles H. Arnold. Arnold was a native of Dorchester, Nebraska, and received his medical degree in 1913. He enlisted with the British Expeditionary Forces during World War I, and served with the Royal Army Medical Corps on the front lines in France and Belgium. 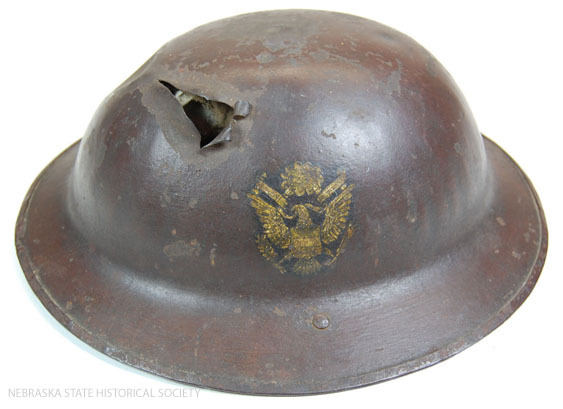 Arnold was dressing a wounded soldier near Aveluy Wood, France, when a German sniper fired a bullet through his helmet. Although Arnold’s scalp was injured, he finished dressing the soldier’s wound before being attended to himself. Dr. Arnold went on to have an active medical career, spanning fifty-three years. When World War II began, he reenlisted and was sent to England, where he served as consulting surgeon to more than fifty military hospitals in Europe. Later he served as an attending surgical staff member and lecturer on surgery at St. Elizabeth’s Hospital (Lincoln, Nebraska); surgical staff member at Bryan Memorial Hospital (Lincoln, Nebraska); surgeon for Traveler’s Insurance Company; special lecturer in the surgical department at Creighton University School of Medicine; and surgical consultant and honorary professor of surgery at West China Union University at Chengtu, China, and at the Chinese Army Medical Center at Shanghai. The Nebraska State Historical Society has a wonderful collection of materials that belonged to Dr. Charles Arnold and his family. Click here to learn more about the Arnolds and see the archival finding aid.